Cleans dozens of bottles quickly! Imagine a system that lets you sanitize bottles 12 at a time, temporarily store them while they drain upside down, and then flush them with inert gas prior to filling. 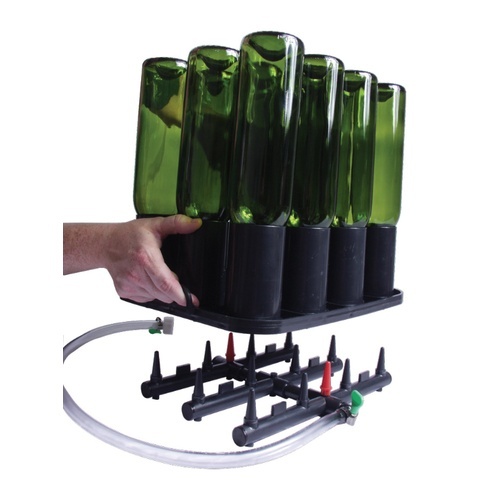 This bottle rinsing base and rack system is your dream come true! 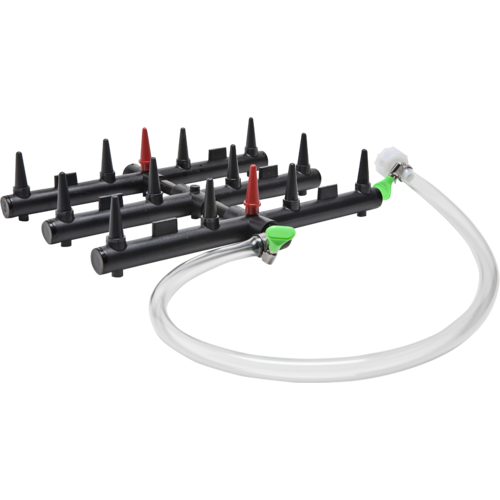 The base portion of the system connects to a water supply for rinsing or to your inert gas system for purging/flushing. In our ideal plan you have two bases. One is used for rinsing, the other, sitting right next to it, is used for purging. You can put the rinsing base in a tub that is re-circulating with sanitizing solution (such as: CL27) or just drain to the ground if you are working outside. *Note: Bottle Racks are sold separately. You will need to buy as many racks (CE971) as needed. Each rack holds 12 bottles. Comes with a female garden hose fitting attached to a plastic 1/2" barb fitting on the unit.